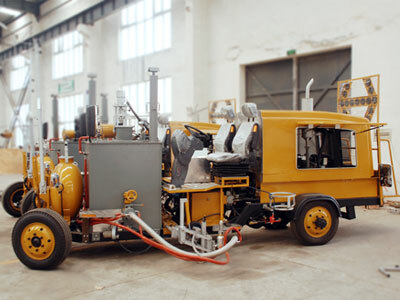 DY-BTS Big Driving-type Thermoplastic Spraying Road Marking Machine are low-pressure air spraying thermoplastic road marking machine with high efficiency and flexibility. 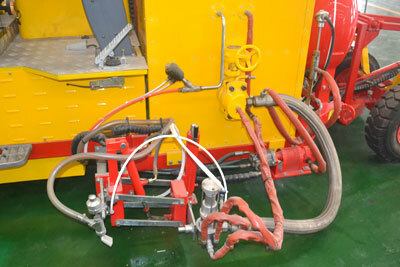 It can serve long distance and continuous line marking work. The spray thickness is adjustable and not effected by the old marking line. 1.Engine: 37KW water-cooled electrical starting diesel engine with four-cylinder in-line that is environmental protection with low noise. The fuel tank Capacity is 60L. 2.Heating mode:Infrared propane heating, electronic ignition, automatic temperature control and conduction oil heating that can save more than 30% fuel compared with traditional heating mode, and make the heating evener, quicker, more secure and more environmental protection. 3. Driving system: Imported oil pressurized continuously variable speed transmission system (HTS) with an automatic brake device that can freely go ahead, back off and stop. The left and right back wheels are equipped with a differential speed gearing to ensure it to drive freely around the curve and change directions timely. Driving speed: 0-22km/h, maximum climbing capacity: 15°. 4. 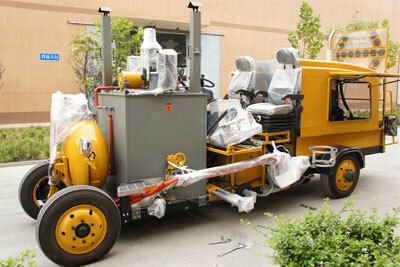 Marking mode: Equipped with double atomized air-auxiliary spray gun with low pressure. The atomized gas's heating oil recycle pump and heat exchanger in this system is able to improve the spray effect. 5. Glass beads spraying system: Equipped with 120L capacity pressurized glass beads bin with windows that can uninterruptedly spray glass beads. Glass beads sprayer can be equipped on the left or right, whose pressure and flow rate and spray width can be freely adjusted to ensure the spraying glass beads firmer, evener and more economical. 6.PLC electronic control: Multi-functional interface; It can be set with various marking types when out of factory according to the requirements of the users. The line type and its length can be freely adjusted to meet the users needs during construction, realizing the full intelligent control. Continuous line and broken line can be finished together in the same program. 7.Paint tank: Equipped with cold rolled, anti-oxidant, steel conduction oil insulated heating tanks with horizontal hydraulic stirring device inside it. The tank's capacity is 300L. The wall of container can be unloaded when cleaning. The emergency valve at the discharging hole closes automatically when the pressure in the tank falls. 8.Air compressor: 3m3/min screw type compressor; the air source storage tank can adjust the pressure and is installed with a safe automatic exhaust device. 9.Warning system: Equipped with double warning lights, whose flicker frequency (sudden flicker frequency) can be freely adjusted. The electronic warning arrow at the back (the flashing direction is adjustable) of the vehicle can improve the safety of road marking operation. 10.Guide rod: The extractable hydraulic guide rod can change directions freely to up, down, left or right. 11. Pre-marking system: Equipped with pre-marking system. It is able to finish the cleaning work mean while the marking operation and the pre-marking work for another line, which greatly improves the efficiency of the road marking construction. 12. Double seats can be overturned and easy to operate and maintain. The operation device and related system can stretch on both sides to meet different customers operation habits.